This beastly slot has been way ahead of the pack since its celebrated beginnings in the casinos of Las Vegas, before ensnaring the rest of the globe with its volatile game play and finally being transformed into an online game for you to now devour via your mobile. Wolf Run is a 5-reel, 40-payline slot, meaning you have 40 chances of winning with every single play. Striking graphics and realistic sounds combine to give you a spine-tingling, sensory experience with incredible chances to win. The bonus rounds feature retriggering free spins, which mean you can win and win again - totally free! o Outstanding free spins bonus with the potential for an incredible 255 free spins! o Striking graphics and an innovative concept making for great gameplay. o Loads of wild symbols. o Already a major hit in casino's all over the globe! Wolf Run is simple to get to grips with, but its money-spinning potential is staggering. With stacks of 4 or more wild symbols on each reel, you can experience this slot's power from only 1p per line, going up to a maximum of £5. Choose from 1, 10, 20, 30 or 40 paylines with the LINE BET box, allowing you to play between 1p and £200 per spin for incredible simultaneous payouts. Enter your credit amount in the LINE BET box, and then click on the PLAY button to spin the reels. Make like the wolf and seize upon your prey with the endless bonuses buried within the furry hide of Wolf Run! Match 3 bonus symbols on the middle 3 reels and night time will fall, bringing with it 5 free spins as you play under the glow of moonlight. If your nocturnal urges throw up another 3 matching bonus symbols on your bonus round, you earn another 5 free spins! All in all, you could win up to 255 free spins!! Get access to the games you want, when you want, with no need to worry about pesky downloads. You certainly won't be stuck for ways to while away your time with Betfred's cracking Mobile Casino available at the touch of a button! You'll also be laughing all the way back to the bank, with plenty of bonuses and rich in-game features in all of our superb Mobile Games. Old favorites like Roulette Classic and 20+ Blackjack are just bursting with ever-evolving bonuses, while their Mobile Casino's new Monopoly Multiplier and Chain Reactions bring a fresh approach to familiar formats. So what are you waiting for? Don't mess about, play about on Betfred's Mobile Casino! Their superb mobile platform recently won the mGaming Award for 'Innovation in Mobile'! 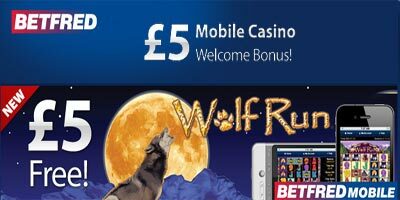 "Wolf Run - New to Betfred Mobile Casino - Free 5 pound for every player"